Can trees “prune” themselves? To “prune” is to reduce the extent of something by removing superfluous– or unwanted parts. Sometimes trees “prune” themselves, allowing branches to fall to the ground. When this happens, a natural pruning can hit people in the head and/or land on vehicles or homes. Have you ever been around a tree when it self prunes? Suddenly, without warning, a limb falls out of the tree after you hear a quick “crack” sound. Oftentimes, the tree gives the people or things around it no warning whatsoever. You don’t see cracks or color changes– it just happens. This sort of pruning is referred to as “sudden branch drop,” “high temperature limb drop,” and/or “summer branch drop.” Causes could be internal moisture changes, tissue shrinkage, gas releases inside limbs, and even microscopic changes in cell wall structure– things that aren’t visible to the naked eye. What kind of trees are most likely going to do the “summer branch drop?” Typically, the more mature ones that have large, mostly horizontal limbs are the ones to watch out for. The drop is likely to occur on an especially hot summer day. Theories abound to why this happens, though it’s generally thought that there’s an imbalance of moisture such that a tree decides to “abort” limbs. 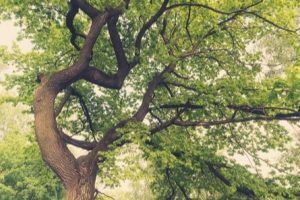 Most trees, from oak to elm, ash to sycamore, and then some, are susceptible to summer branch drop. What are some ways you can help prevent the trees on your property from pruning themselves? First, expose trunk flares– such that the spot where the trees meet the ground should not be buried. Why? Because buried trees are stressed out trees, more likely to prune themselves. Next, have a professional pruning service come take care of your trees before the trees themselves decide what they want to do; pruning by Forest Tree Service can help thin out branches “just enough” without being excessive, while also avoiding flush cuts. Thirdly, consider regular tree care. Use organic fertilizer around your trees and aerate that soil area. If your trees are sick, have a professional company treat them so they heal. Finally, pay special attention to when and how trees on your property are watered. Ideally, trees do well with deep and infrequent watering. In other words, don’t under or over water them. Of course, having a professional tree care company evaluate and remove any potentially dangerous limbs and trees is the most surefire to make sure your property is not at risk. If you’re having tree problems in the Kingwood, TX, area, contact Forest Tree Services at 281-381-4125.